Palm Lakes Village is made up of 55+ “young at heart” community members. We take pride in our truly caring, supportive and safe senior community, where volunteering comes from the heart. Palm Lakes Village is a place where people eagerly participate in activities, dinners, dances and meetings. A place where residents take ownership in the Village to maintain a quality of life not only for themselves, but also for the entire community. 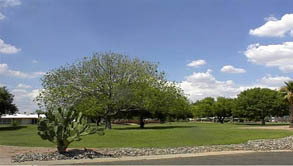 Palm Lakes Village is located in the Paradise Valley area of Phoenix. 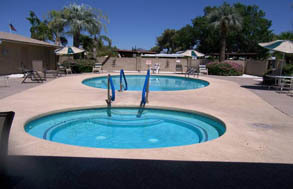 Palm Lakes Village is a highly desirable choice for active adults living in the Valley of the Sun. A wide variety of mobile and modular homes reside on 363 privately owned lots on 80 acres of land. Palm Lakes Village, with its sun filled days, is indeed a paradise in adult living. This achievement and success is the result of the continuing efforts of so many of our dedicated resident volunteers. Take an evening stroll around our lake on the Path of Celebration walkway or relax on the benches and enjoy the sound of the fountain and mountain views. Please check out the Events and Amenities as well as our Area Businesses. click the Contact Us button or just call us at 602-992-6546. We cordially invite you to come and explore Palm Lakes Village. See what is available in this property owned active adult senior community in the sun.